"Margaret (Pooley) had bought Ch. Jolly Arno of Edgetowne ROM, CDX as a youngster. Margaret trained almost all her dogs to obedience degrees and her pedigrees are filled with dual titled dogs of her own making. 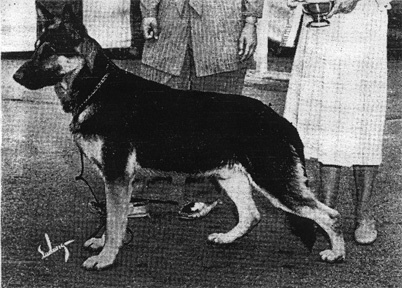 Jolly Arno not only had a CDX but he came from a litter of renown with multiple champions and a beautiful pedigree. The breeding that produced the "J" litter of Edgetowne was in bred half-brother half-sister, 2-2 on Ch. Derry of Long Worth ROM, a top producer from the "D" litter. Jolly Arno's siblings were GV Ch. Jory of Edgetowne ROM, Ch. Jaunty of Edgetowne, Jan and Jumar.